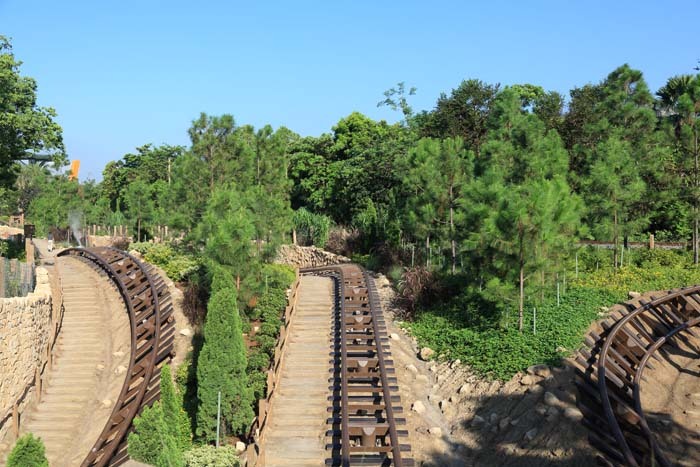 When Hong Kong Disneyland wanted three new lands built, they returned to the Australian company who performed a vital role in the construction of the base park – Design Landscapes Pty Ltd. 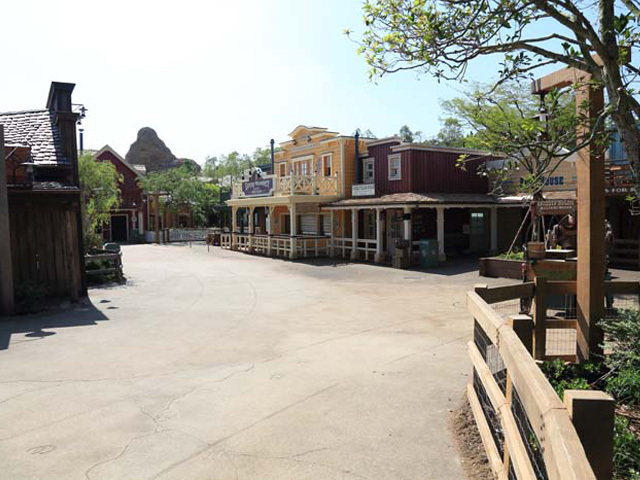 The design specifications for Grizzly Gulch at Hong Kong Disneyland required an American Wild West frontier town to be recreated in Asia. This needed all of Design Landscapes’ considerable skills in logistics, themed concrete and hard and soft landscapes to fulfil the brief. The most notable aspect of the project is the realistic appearance of the themed finishes. Over 4000m2 of concrete was themed to look like dirt roads, rough tracks, pot holes and mud flats. To give the main pedestrian access path a more convincing “frontier town” main street appearance, horse and cart tracks, bear prints and a secondary layer of texturing cracks were included in the concrete, using a multi-faceted process. Even the buildings have concrete floors stamped to look like timber. Design Landscapes is leading the way in using this type of themed concrete technology. It begins with integral coloured concrete and hand seeded aggregates – for this project, eight different aggregates were used. Then colour release agents, stamping and imprints, such as bear prints and cart tracks, were added. Retarders, acid wash and colour staining were then used. By utilising this detailed process, Design Landscapes is able to give the concrete texture and 3D effects such as potholes and cracks. Large stones were used to blur the fixed edges to create a natural look. 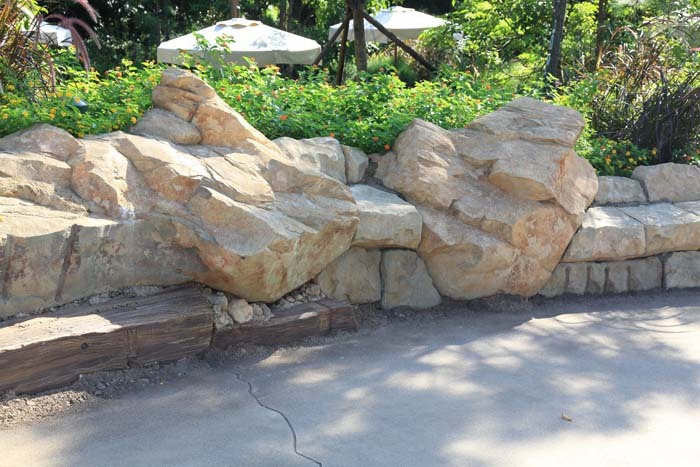 Not only did the concrete need to be themed correctly, it also needed to be functional, so it is 225mm thick to allow emergency vehicle access. 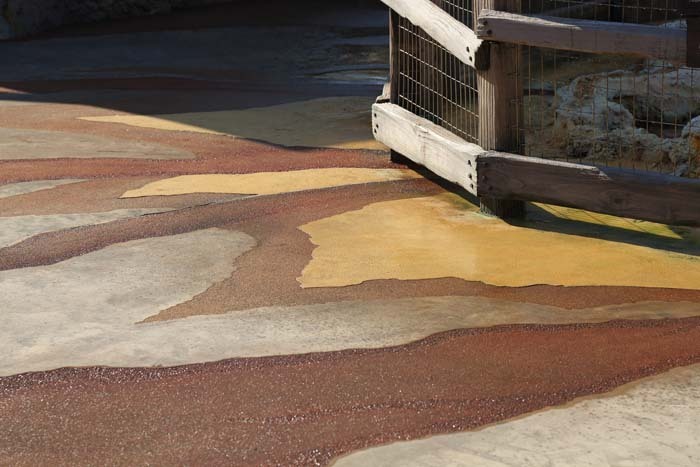 The themed concrete was installed on multiple fronts to ensure completion occurred within three months. Another critical component of the design was the need for soft landscapes to screen views that distract from the Wild West theme. It was also essential they look established for opening day. To achieve these goals, mature sized trees and shrubs were used. Plants were carefully selected from around the world and imported into Hong Kong.